Daniel: I’ve always been the good son, the good student, living up to my parents’ high expectations. Never the poet. Or the dreamer. But when I see her, I forget about all that. Something about Natasha makes me think that fate has something much more extraordinary in store—for both of us.The Universe: Every moment in our lives has brought us to this single moment. A million futures lie before us. Which one will come true? A lot can happen in the matter of one day. Accomplishments, failures, happiness, sadness and even love. What if one day you woke up, went for a walk, bumped into someone and from that moment on your life was forever changed. 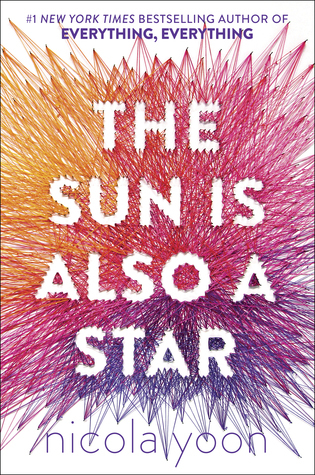 Nicola Yoon is back with another story of finding love even when time is at its worst. The book tells the story of Natasha, a girl with a bright future but only has twelve hours before her and her family is deported back to Jamaica and Daniel, a Korean-American who follows the rules and wants to live up to his parents expectations. However, when paths are crossed, time freezes and there lives are about to be changed forever. Natasha and Daniel were both interesting characters. Natasha is a teenager that unfortunately falls victim to her dads mistake and she goes out into the world to try and fix it. She is the most persistent person, some might even say stubborn but below all that frustration is a girl who shows different layers of emotion and vulnerability that the reader is able to latch onto and fall in love with. Daniel is the boy that comes from a family who has expectations and if he wants to continue to have their support, he must abide by their wishes. However, with Daniel there is some sort of a rebellion growing inside of him and for him Natasha is the person to release it but is it for the better? What I liked most about the book was that the story took place in a matter of one day. i am curious how this idea came about with planning all the events in a matter of one day and where the inspiration came from. This is not a book I feel one could finish in a day or I wouldn't recommend it. I took about a week and this allowed me to take in everything that was happening and allow myself to harness a sense of what both characters were feeling. 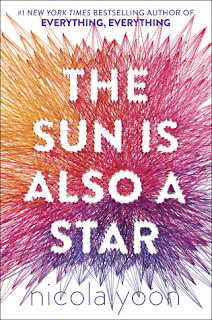 Overall, Nicola Yoon took me on yet another emotional ride with her sophomore novel. I recommend this book to all readers and of course check out her debut novel Everything, Everything. You will be swept away by your emotions.